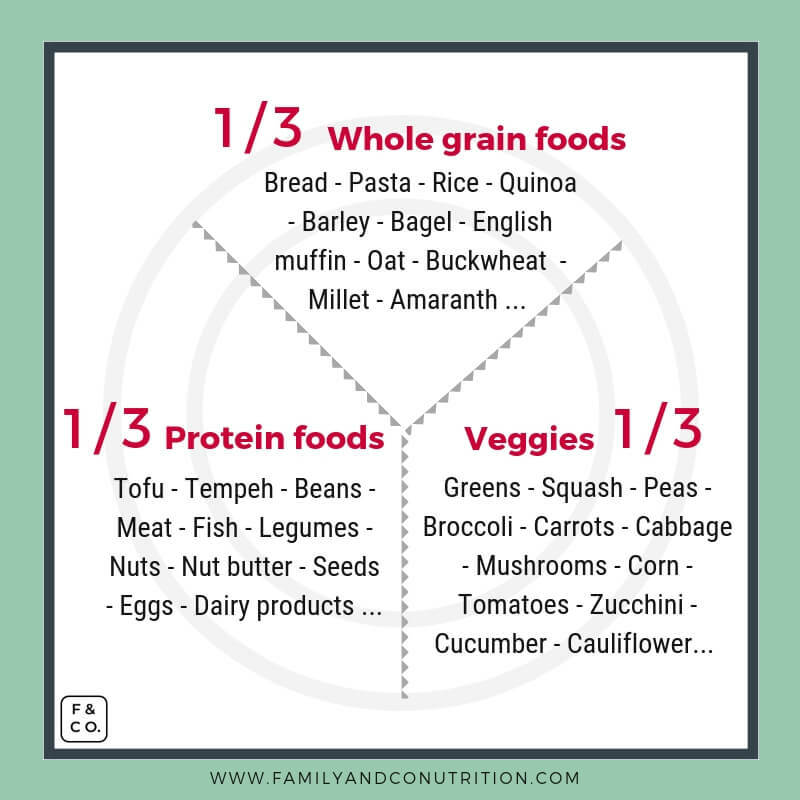 Balanced plate of food: what it looks like for your family? 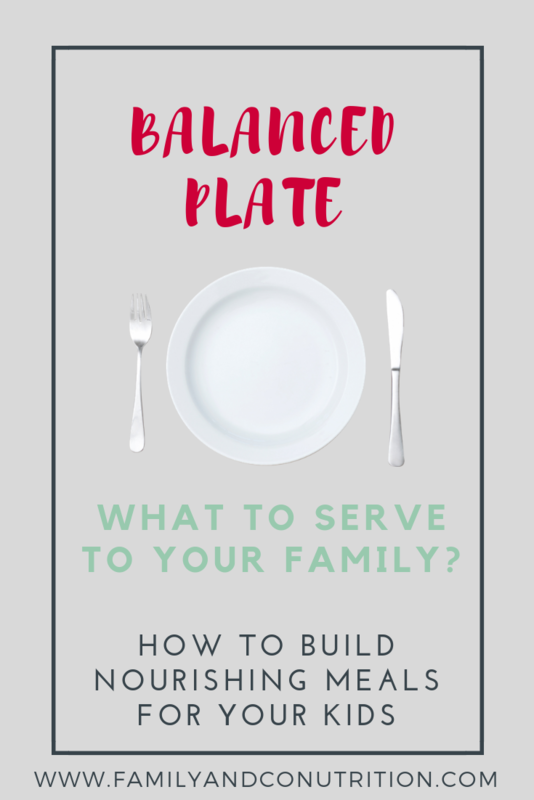 When it comes to eating habits for all members of your family: it’s all about a balanced plate of food. Simple enough to remember. Applicable for all meals. For all eaters. All the time. We are not counting anything, we are not keeping track and focussing on specifics. We focus on one meal at a time, 3 components + snacks. You might have seen Canada’s new Food Guide. It suggests a balanced plate for all Canadians. Yay! 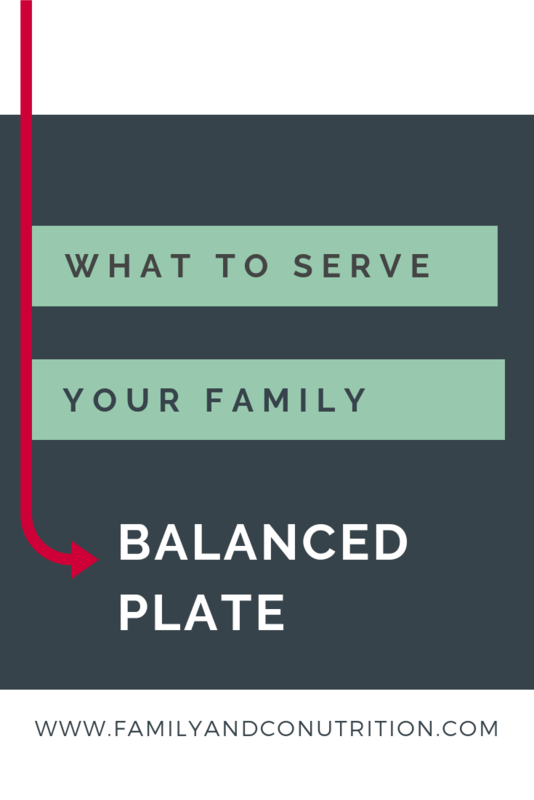 So your family can make small changes to adopt the balanced plate. You and your kids can adopt the balance plate with 3 equal parts. 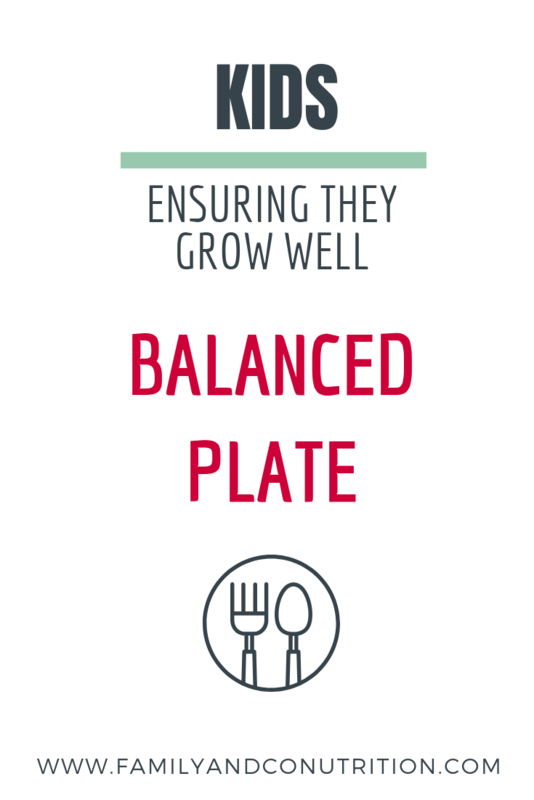 It’s the balanced plate we have used with our clients for years. We took out fruits from the plate, as it is more common to eat fruits as desserts or snacks. Visualize your plate. Divide it in 3 like you would if you were to serve pieces of pie. Need inspiration how on to add more plant-based proteins in your family meals? Veggies are sources of fibres and a ton of nutrients. Fibres will help you feel full and stay full longer. Nutrients ensure that your bodily functions are A-okay. Think outside the box here. Be adventurous. Salad, soup, roasted/steam/raw veggies. Mix the ones your family prefers with new ones. And take a look at our best ways to get your picky eaters to eat their veggies. Grain products provide carbohydrates and fibres. We don’t need added refined sugars like syrups, or super transformed food like breakfast cereals, granola bars and juice. Rather, we need complex carbohydrates found in grain products to get fibre and energy. Fruits are delicious. Isn’t that a good enough reason to eat them? OK, they also provide carbs and fibres. They make for a nice snack or dessert as they bring color and flavor to your meal. Glass of Water (or milk). Up to your preference, but water should be your main drink throughout the day. That is not to say you cannot enjoy a cup of coffee in the morning and the occasional glass of wine with dinner! Breakfast as we know it is rather carb-rich (and sometimes refined sugar rich). 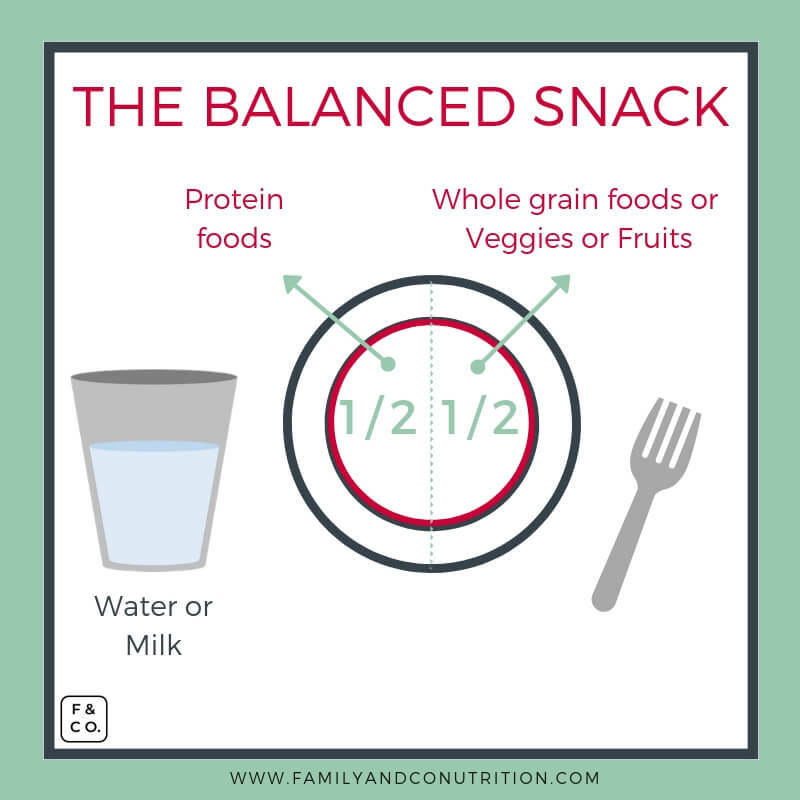 A balanced plate for snack too! Need more inspiration for snacks, here are some ideas! 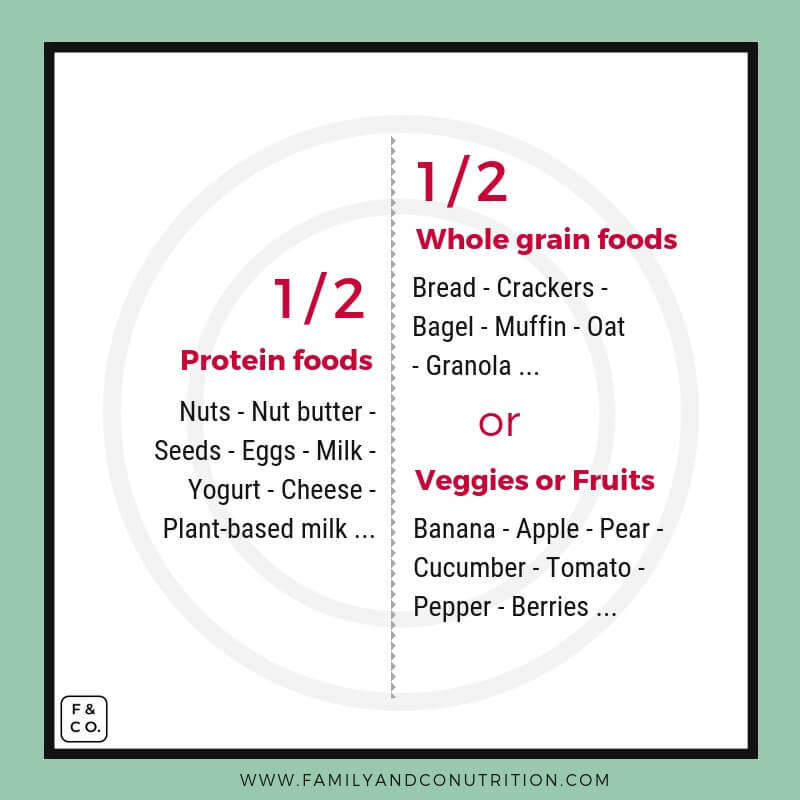 Apply the balanced plate even for breakfast and snacks. 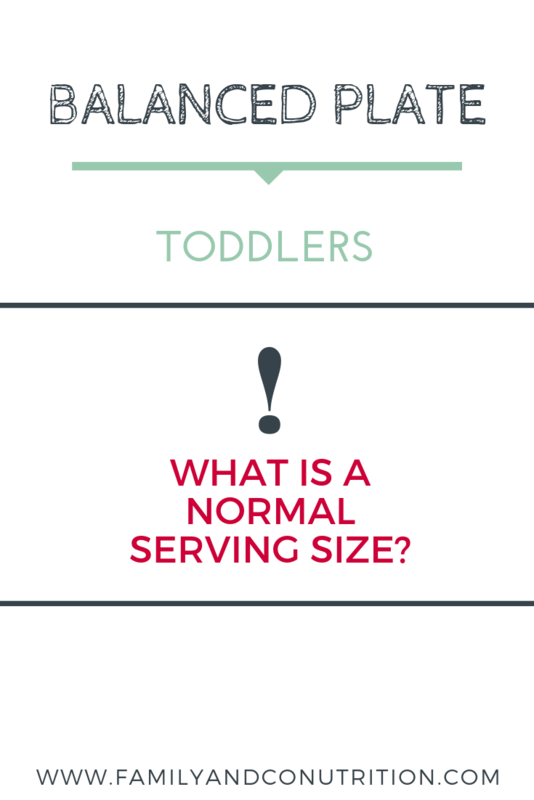 How big is a serving size on the balance plate? The best thing about the balanced plate is the absence of serving sizes! We are working with proportions rather than portions of food. Serving sizes can guide people, but have the downside of “prescribing” an amount to eat that is difficult to personalized. Rather, it is more intuitive to follow the balanced plate with the 3 main components. Listen to your body cues: still hungry? Serve yourself another balanced plate. Full in the middle of your meal, stop eating. You’re the only one that knows what is the right serving size for you at that moment. Where do pleasure foods go on the balanced plate? For Maude it is chips, sour candies, and dark chocolate with the caramel bits inside. For Sarthak it is cheese pizza, chocolate milk, and brownies. For you, is it a piece of cake? Bacon? Cupcakes? YUP. you can eat those as part of your balance plate… And not feel guilty about it. It also mean that your kids can also eat these type of food from times to times. Picture the balanced plate as your foundation for most of your meals. Pleasure food are sometimes completing your meal as you celebrate with friends, share family traditions or simply because you feel like it. Remember, we aim to eat this balances plate at most of our meals, most of the days. Why we love the balanced plate of food for most families with kids? We like the simplicity of the balanced plate. We want something that is easy to remember, apply and explain. We also like that it can be modified to please almost everyone. Pescatarian, vegetarian, vegans, meat lover, allergies and intolerances…. 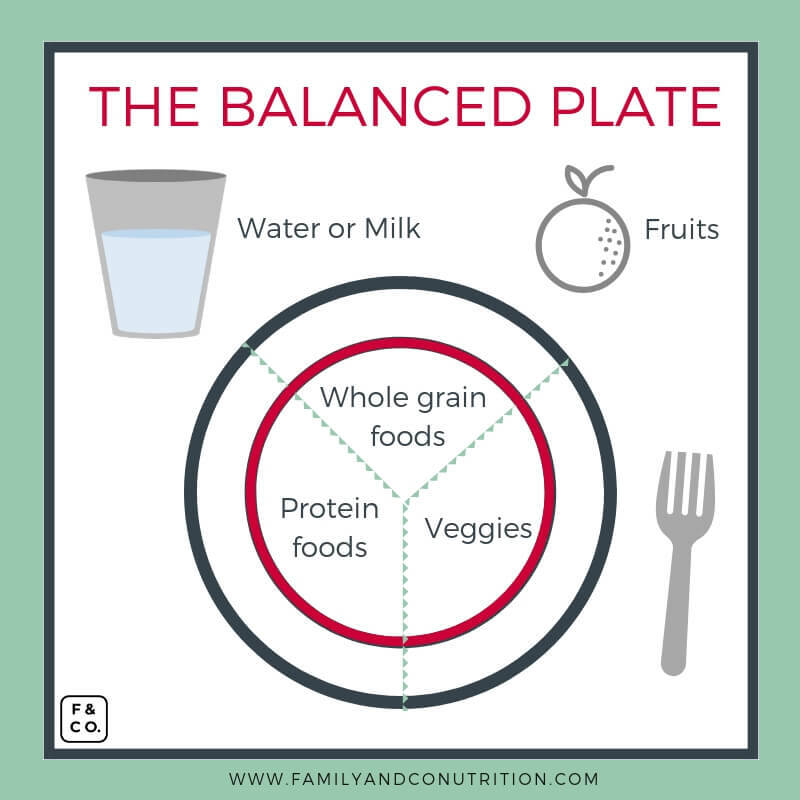 If we aim to eat this balanced plate at most of our meals, most of the days, it would actually be a big win. We are not talking extreme dieting, cutting down the calories and starving ourselves. We are looking for actions that you can adopt for the rest of your life. Actions that will become ingrained in your routine and become second nature. Habits that eventually won’t require efforts. Habits that will bring benefits to you and your family: balanced meals, a variety of food, more energy, less cravings, and no banned food. 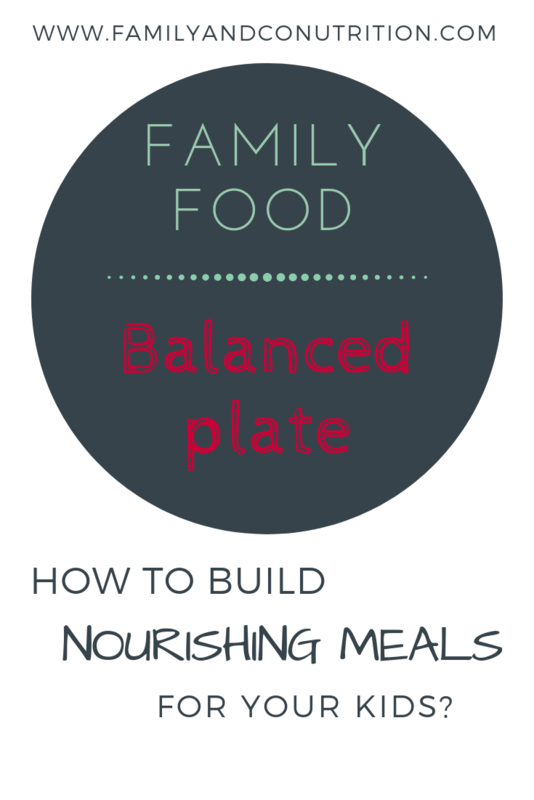 Adopting the balanced plate is feasible and realistic for your family. Steady nutrition changes will become long term habits with long term benefits. How to adopt the balanced plate of food? Not a fan of veggies? Oops, we never eat proteins it seems like! It’s time to shake your old habits and get into a new mindset. Start with one balanced meal. Maybe you’re the type who prefers to plan and get used to the idea. Select the best conditions: a weekend, when your fridge is full, when you have helpers to cook, when you have time to breathe. Or maybe you jump right into it and try it out on a Monday night? You can do this. Your family can do it. It’s time to lead by example, rally the troop and make it happen… one meal at a time. 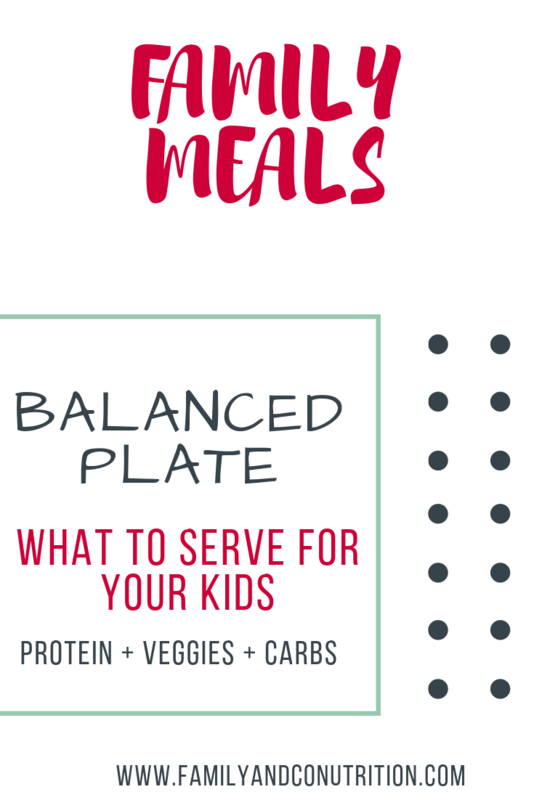 Is a balanced plate realistic for my picky eaters? We see it: you’ve got 5-6 go-to-meals the kids won’t complain when it’s on their plate. Their favourites. The ones that aren’t what you’d hope for them to eat but you figure the peace of mind is TOTALLY worth it. How do you bring the idea of the balanced plate without generating hunger strike? Get the kids involved. Depending on their age, your kids can help. Ideas include: selecting the protein foods, the side veggies, the fruit dessert, or the recipe. It’s empowering as you trust them. They are also more likely to eat it if they had a say in the menu. Not sure how to include your kids in the kitchen? We have some ideas in this post. Try the family style service: Put everything on the table and let everyone serve themselves. Role model on your own plate what a balanced plate would look like. Build on the favourite meals: You select one of their favourite meal and modify it so you get a balanced plate. 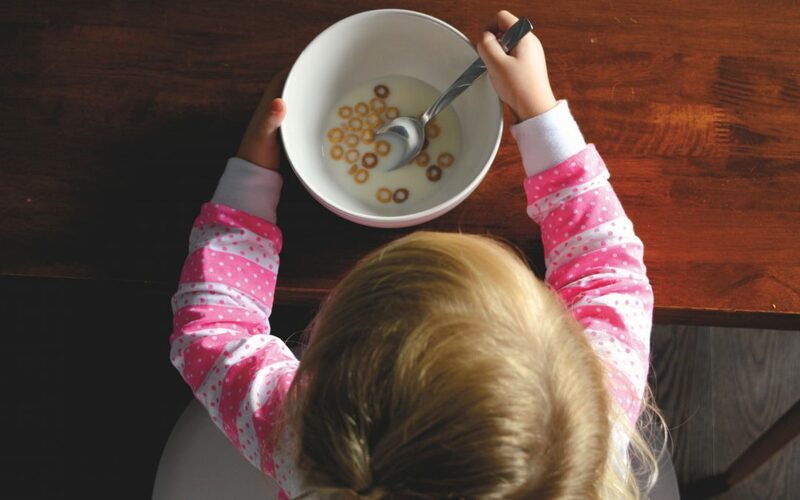 Adding components to a favourite meal can be a good strategy to reassure anxious kids. It can be comforting to serve novel food as well as preferred ones. 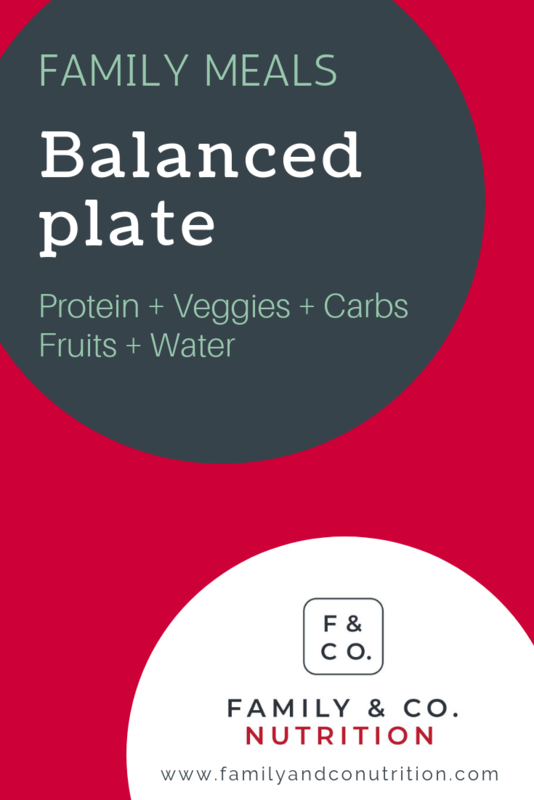 Whatever your strategy, give the balanced plate a try. Today. Or tomorrow. Small changes could lead to big results. With whoever wonder what is this green thing, start the dialogue. Don’t lie. Explain why the change and name the 3 components of your balanced meal. For young kids, you can ask them if they can recognize what is the veggie? Or make them list potential ideas for grains. For teenagers who might have participated in the menu elaboration, share your feedback. Does it taste good? Do the components work well together? If it is a hit (or good enough meal!) write it down. Slowly build your bank of meal ideas. Make it a family matter. 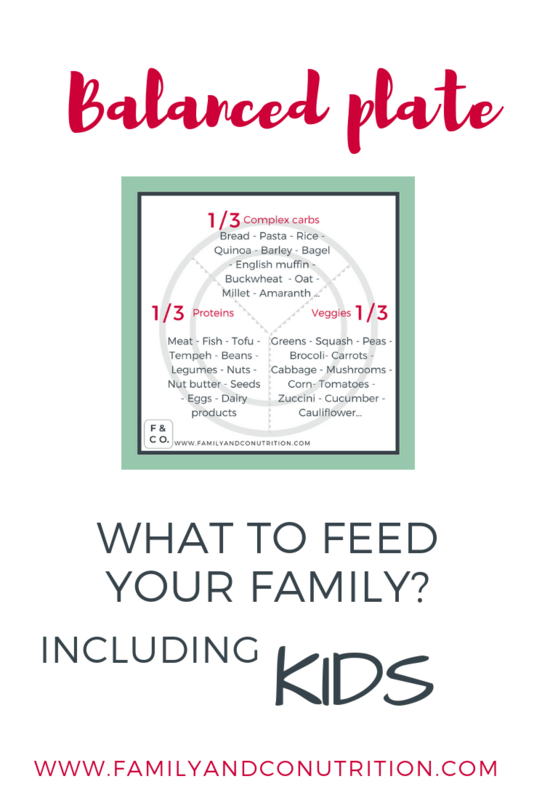 All family members can adopt a balanced plate and help with the weekly menu. 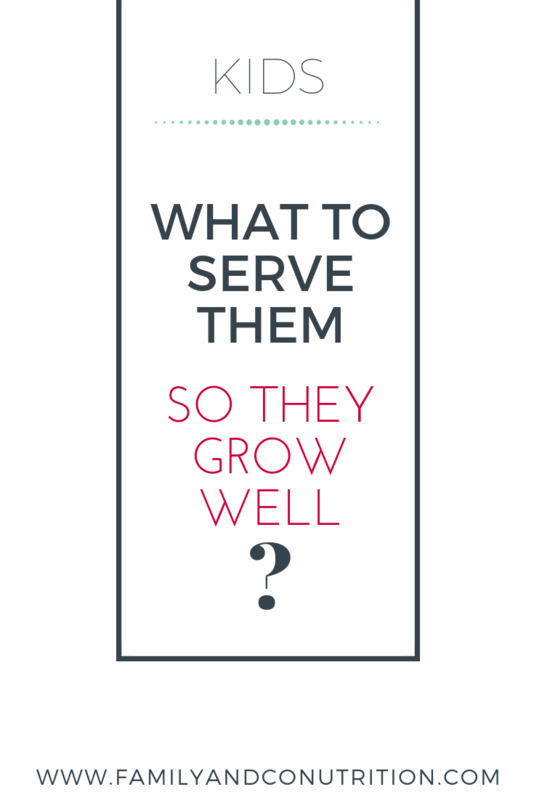 Let your kids serve themselves. Let them decide what goes on their plate from the meal. Don’t force them to finish their plate. Above all, avoid all comments on What, How, and If they decide to eat 1-2 or any component of their balanced plate. You take a deep breathe, remind yourself they won’t let themselves die of hunger and you focus on your own plate. You did your parent duties, now you enjoy your meal. And if meal time is battle time, perhaps it is time to adopt adopt family rules, and drop food rules. Everyone including the kids are in charge of their appetite. Challenge yourself to let it go and enjoy your meal during family dinners.